Today's cooking preferences often begin with the type of stove you have. 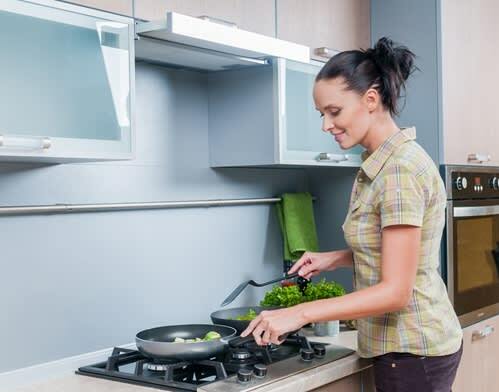 There are many benefits to cooking on a gas or induction stove. Some people feel that they have more control over the heat source with gas stoves while others prefer the control and safety that induction cooking provides. Viking has several gas models that come with four or six open burners for the utmost convenience. Combined with their ProFlow convection oven, Viking addresses all of your cooking needs. However, thinking about ventilation and utilizing your equipment properly is the key to ensuring that you aren't creating health problems throughout the rest of your home. Mounting a cooker hood or an over-the-range microwave above your stove and keeping the filters free of grease and smoke residue assist in circulating and venting polluted air. Researchers from the Lawrence Berkeley National Laboratory have looked further into how fumes can cause pollution inside of homes. After analyzing California households that cook at least once per week., they determined that about 60 percent of them had air pollution levels that would be considered illegal if measured outdoors. This meant that about 12 million Californians were exposed to nitrogen dioxide regularly. Nearly 10 million were susceptible to formaldehyde that exceeded federal regulations. "Electric burners produce ultrafine particles essentially by volatilizing dust," Brett Singer, who helped conduct the study, told the news source. "It's the same process with your toaster, resistance heater or radiator if you haven't used it for a while. Once they're in the air, they recondense into these ultrafine particles." Just because your everyday appliances can cause air pollution doesn't mean that it's going to happen each time you use them. Furthermore, it doesn't indicate that you need to stop cooking! Properly using your appliance is the key to maintaining the health of your household. Proper air circulation is critical to ensuring that pollutants aren't sticking around in your kitchen. Ideally, you should try to use the back burners of your cooktop when making a meal to make sure that the steam makes its way up the vent and out of your home. If you don't have a range hood in your kitchen, try to keep a window open while you're cooking to allow the contaminated air to escape outdoors. While not many people are up to speed on the facts about indoor air pollution, learning more about the problem can help homeowners prevent it in the future.